The primary poise of the Supermind is fundamentally based on 'the inalienable unity of things' (Ibid,pg 158). In fact, this poise holds the very idea of creation as a creative essence which is like an inbuilt program existing in the womb of what is initially an indivisible and unitary consciousness. This poise represents the comprehending principle of the Supermind. The comprehensive state of the Supermind that characterizes its primary poise has no place for individualization and an experiential contact needs the exceeding of the ego. However this experience is also similar to that of the Yogi who has come into experiential contact with the Transcendent beyond Space and Time for the ego does not exist there too. There is of course a gulf of difference between the experiential contact with the Transcendental Infinite and that with the comprehending Supermind. The Oneness of the Transcendental Infinite is experienced by rejecting, surpassing or dissolving the multiplicity. It is an infinitely blank oneness that negates all multiplicity. It represents a pure Unitarian consciousness that is bland, without attributes and without qualities. The Transcendental Infinite is actually'a timeless and spaceless concentration of Sachchidananda in itself, in which Conscious Force does not cast itself out into any kind of extension and, if it contains the universe at all, contains it in eternal potentiality and not in temporal actuality' (Ibid). In contrast, the comprehensive Supermind is experienced through an equal self-extension of the 'oneness' in all manifestation - all-comprehending, all-possessing, all-constituting. It is an oneness that holds in its bosom the essence of multiplicity. It is therefore a unity that is totipotent, vibrant and dynamic. While in the Transcendental Infinite, the 'ALL' does not exist at all, in the comprehensive Supermind, 'all is one, not many', though there is no individualization (Ibid). 'It is when the reflection of this Supermind falls upon our still and purified self that we lose all sense of individuality; for there is no concentration of consciousness there to support an individual development. All is developed in unity and as one; all is held by this Divine Consciousness as forms of its existence, not as in any degree separate existences. Somewhat as the thoughts and images that occur in our mind are not separate existences to us, but forms taken by our consciousness, so are all names and forms to this primary Supermind. It is the pure divine ideation and formation in the Infinite, -- only an ideation and formation that is organized not as an unreal play of mental thought, but as a real play of conscious being. 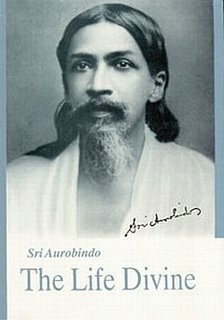 The divine soul in this poise would make no difference between Conscious-Soul and Force-Soul, for all force would be action of consciousness, not between Matter and Spirit since all mould would be simply form of Spirit' (Ibid).